Cotton has been an important part of civilizations throughout the globe for thousands of years, with a history that is every bit as rich as it is mysterious. There is even an entire wikipedia page dedicated to the history of cotton in addition to the entry for cotton! 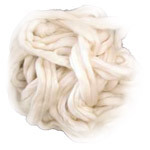 Today, we'll be focusing on cotton fibers for spinning, starting with where it all begins: on a tree or shrub. Cotton is actually a tropical plant, so it thrives in a hot climate and needs lots of water. 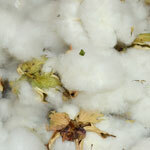 Harvesting cotton is a very tricky business: if done too early or too late, the cotton fibers will be of poor quality. Cotton growers test the cotton daily to determine the ideal time to harvest either by hand or with a special machine which removes the boll intact from the plant. After the harvest, the cotton is ginned to remove seeds and remaining parts of the boll from the cellulose fiber. Most of you probably remember the name Eli Whitney from your grade school days: in 1793, he invented the cotton gin and revolutionized the way cotton was processed, giving way to the modern cotton industry we know today. Prior to the invention of the cotton gin, the cotton fibers were painstakingly separated from the seeds by hand! Once the cotton is successfully separated from the seeds, it is usually carded into a preparation known as sliver. This is a preparation which is thinner than roving, and many commercial cotton yarns are spun from sliver. Cotton is a popular choice for warm-weather projects, but many spinners are intimidated at the thought of spinning cotton fibers due to their short staple length. Luckily, there are a few preparations which can make working with cotton much easier! Spinning from cotton sliver is a great place to start, since the fibers are combed into alignment when processed in this fashion. 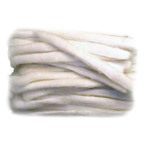 Another preparation to try is cotton punis, which are similar to rolags . You can make your own or purchase ready-to-spin punis; while they can be spun on any wheel or spindle, they work especially well with the Charkha, for which they were designed. A charkha is a spinning wheel which is ideal for spinning short-stapled fibers such as cotton, and it was made famous by Gandhi, who used it as a symbol for the Indian independence movement against British rule. 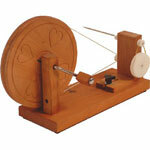 In addition to spinning cotton, a charkha would come in handy for spinning angora, silks, or very fine wool. In our next blog post, we'll have a special guest who will share tips for using cotton to spin textured, non-traditional yarns.